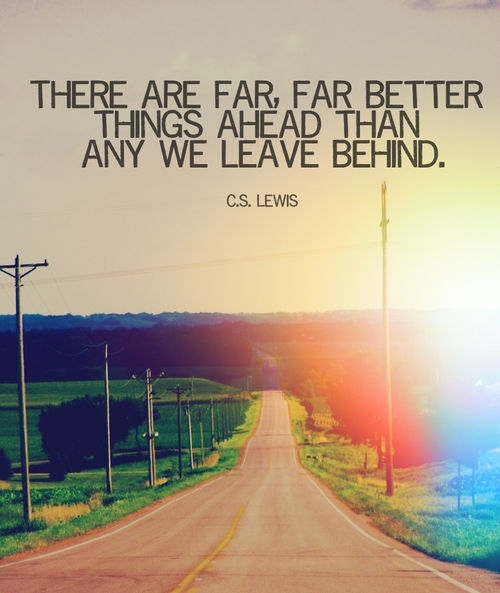 I found this picture with the CS Lewis quote here when I was blog hopping the other day. It sums up quite neatly where I am at the moment. As regular readers will know, the future for my congregation is very uncertain. Uncertainty increased this week when I received the surveyor’s report on our halls complex with attendant costings. The rest of the month holds meetings and discussions about the future. I have spent the past few days organising reports and paperwork, writing letters and addressing envelopes (as you do when you are off sick!!). Please pray for us, for strength and wisdom, for patience and grace as we consider our options. But mostly pray that we will hold on to the hope that there are indeed “far far better things ahead than any we leave behind”.